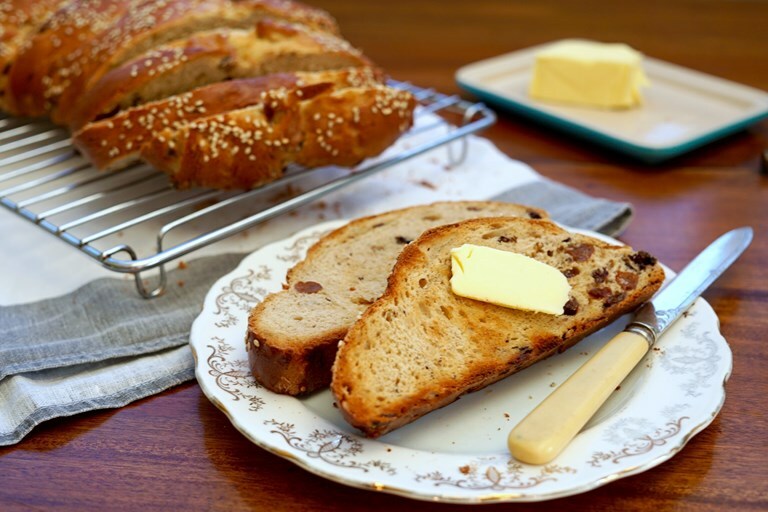 Elly’s spiced fruit bread recipe makes a fantastic alternative to hot cross buns this Easter. Packed with warming spices and tea-soaked dried fruit, serve this beautiful enriched bread toasted with plenty of butter for brunch or afternoon tea. A warm slice of spiced fruit bread is one my favourite brunch treats. This bread is a little like brioche, but with less butter and less arduous preparation. However, because the dough is enriched with butter, milk and eggs it has all the sweet, pillow-soft richness of a classic brioche. Recently, it occurred to me that the dough is basically the same enriched dough used to make hot cross buns. 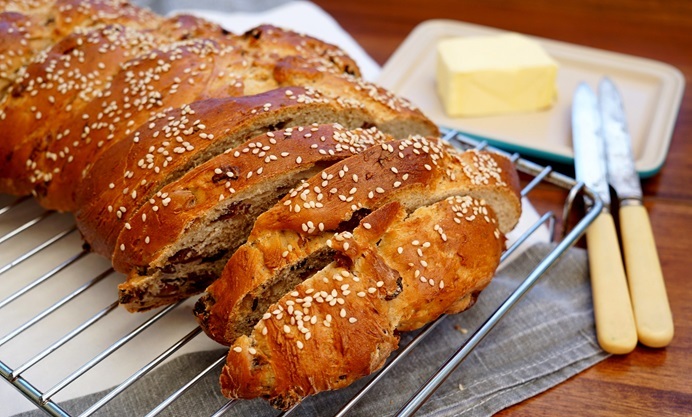 Adding spice and dried fruit to the basic plaited milk loaf turns it into a ‘hot cross loaf’, with all the warm fragrance and fruity sweetness of those beloved buns. I like to soak the dried fruit in aromatic tea before adding it to the dough; this helps it stay plump and sweet, and also brings another layer of flavour, particularly if you use a tea like chai or Earl Grey. This loaf is easy to make but looks beautiful and impressive, and can be sliced, toasted and buttered on demand. No need for piping crosses or shaping individual rolls; this is the kind of treat bread that should simply be placed in the middle of the table with a slab of good butter and devoured at any time of day (or year).